David Deamer, research professor of biomolecular engineering. Biochemist David Deamer will discuss the origins of life in a free public lecture on Thursday, November 13, at UC Santa Cruz. 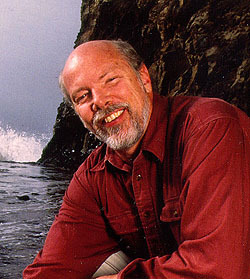 Deamer, a research professor of biomolecular engineering at UCSC, will discuss "What Is Life? What Was Life? What Will Life Be?" in an Emeriti Faculty Lecture. His talk will begin at 7 p.m. in the Music Center Recital Hall and will be followed by a reception. Deamer has been investigating the origins of life for more than 20 years. He is particularly interested in the ability of certain molecules to self-assemble into more complex structures such as biological membranes. Deamer and his research associates have been studying self-assembly processes in the laboratory and in natural geothermal environments that simulate conditions on Earth before life began. In his talk, Deamer will show how self-assembly of certain molecules in membranous compartments was likely to be involved in the origin of life. He will also describe recent progress he and others have made toward fabricating synthetic cells in the laboratory. Deamer earned a B.S. in chemistry at Duke University and a Ph.D. in physiological chemistry from the Ohio State University School of Medicine. He joined the UC Davis faculty in 1967, then moved his laboratory to UC Santa Cruz in 1994. The Emeriti Faculty Lecture is sponsored by the Office of the Chancellor. For more information, contact the UCSC Special Events Office at (831) 459-5003 or specialevents@ucsc.edu.